The RK-8000 series was designed on a modular platform and can be supported in-house with the provided tool kit or with standard tools available in any maintenance department. The three models available have many interchangeable parts and access to these parts is only 24-48 hours away in most cases. The long stroke of the RK-8000 series helps ensure that the rivet is set with one pull of the trigger and the vacuum mandrel collection system is easily adjusted to help reduce the load on shop air compressors. These tools are provided in a blow molded case with organizational foam inserts which is especially helpful for companies developing 5-S strategies. All tools are serialized for maintenance tracking. Every RK-8000 tool comes with a one-year factory warranty*. The RK-8000 series is simple to operate and easy to maintain. With an easy vacuum adjustment, ergonomic grip and light weight, the RK-8000LS is a good solution for all levels of production without breaking the bank. The RK-8000 series tools come with their own clamshell case, replacement jaws, tools and nose pieces for all the rivet sizes they install. Did We Mention The RK-8000 Rivet Tool Is Modular? The RK-8000 series of tools is modular. This lends itself to less expensive repairs by only having to replace specific components that fail. Not only are the modular components more affordable to replace, they often require less labor to install. For example, the mandrel collection canister is an item that frequently gets broken or lost on any rivet tool. Where competitors may charge around $40 to replace this item, the RK-8000 component costs around $24. The RK-8000 series of tools are easily maintained by a competent maintenance staff. Video: Watch the RK-8000LS in action below. While many competitors are still using an outdated 2 jaw system, all RK-8000 series tools use 3 jaws. The 3 jaw system is inherently better because of how efficiently it grabs the mandrel on three sides as opposed to two which helps minimize scraping and provide longer jaw life. They are also affordable and often cost less than half that of a competing tool. The stroke of the RK-8000 series tools is longer in comparison to other rivet tools on the market. Why does this matter? Other tools with shorter strokes require a more precise balance of air pressure and hydraulic oil to be most effective in pulling a variety of rivets. 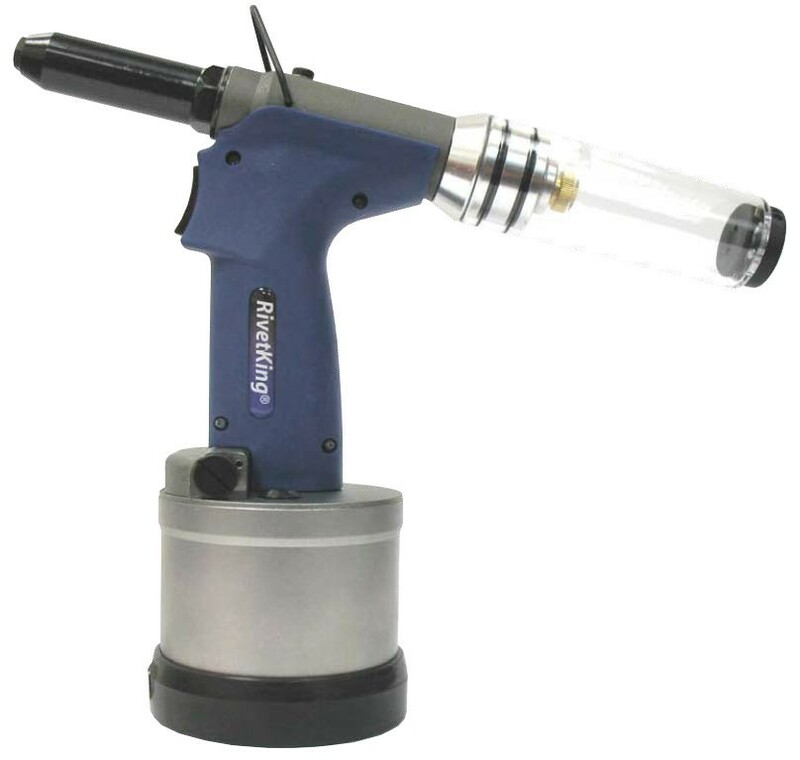 With the long stroke of the RK-8000 series tools, that balance is exaggerated since the tool will often be able to set the rivet completely even during a low pressure or low oil scenario where other tools would fail to operate completely or require two or three presses of the trigger to complete the installation. It’s one of the most forgiving rivet tools available today. Whether producing one-off fabrications or running large production runs, you should give the RK-8000 series tools a serious look. The RK-8000 series embodies some of the most versatile, user-friendly rivet tools available today. We look forward to hearing from you and sharing what these tools can do for you. Contact Us today, ours customer service team is always waiting to help!